Everything is darker without the moon, yet despite the lack of light I can see almost as well as in the daytime. The nightlife shifts and stirs all around me, yet I fear nothing. If anything I’d be the predator now, I guess. It wasn’t until I had already spent hours wandering aimlessly down the old country highway I remembered I have no keys, no purse, all of which are lying on the ground in the market’s parking lot. There’s a good chance it’s all been stolen by now. Maybe it’s a sign I’m not meant to go back home. Maybe they will think the crash was too much for me and I just kept driving. Or maybe it’s my only excuse for my tardy entrance when or if I ever find my way home. But in all reality, what kind of mom can I be now anyway? I’m a monster. And not just any monster. I’m a monster that might easily trade the ones she loves most for one more hit of her new addiction. The thought of turning my family into nothing more than a meal sickens me but still, my throat flares up at the mere thought of blood regardless of who it belongs to. I disgust myself. “I. AM. A MONSTER!” I scream into the darkness. The words scratch through my dry, burning throat and up into the star-filled sky. I fall down hard to my knees, like the tears falling fast down my face, waiting to feel the sting of the hard blacktop as it tears through the knees of my jeans. One day in and already I’m longing for a simple reminder of my humanity, only I feel nothing. I lie down across the double yellow line and shut my eyes tight, hoping any minute now I’ll wake from this nightmare.. 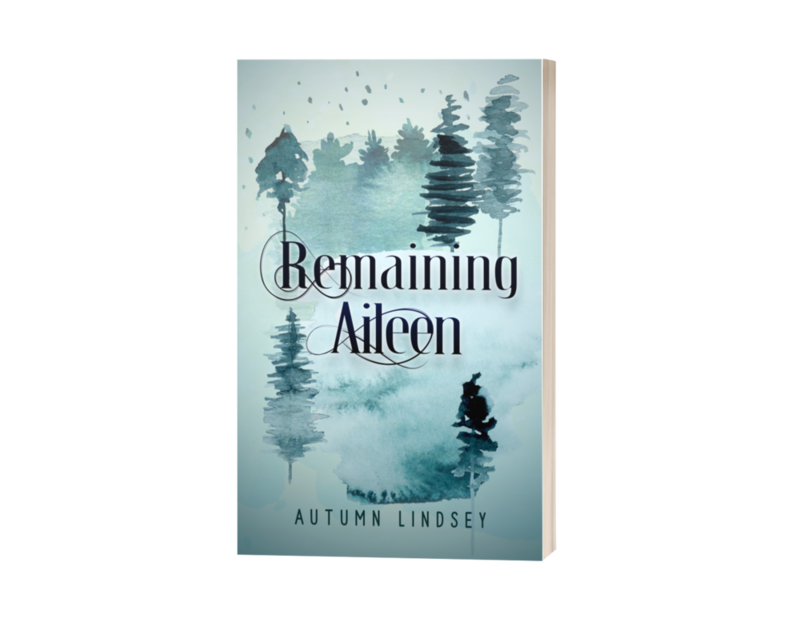 Autumn Lindsey - In short, REMAINING AILEEN is about a mom who becomes a vampire and follows her inner journey to reconcile her new life with her old life. When Aileen wakes up in the hospital after her plane crashes during a storm, everyone says it’s a miracle. All Aileen cares about is seeing her husband and children again. Unfortunately, it doesn’t take long for Aileen to realize her survival wasn’t random. Her mind and body are changing in ways she can’t explain. As Aileen grows desperate for answers, a man assumed dead from her flight appears to reveal a dark truth about her survival. Drowning in the reality of her new life Aileen is forced to make a choice: live forever, or once again face death. Except living might cost her everything she wanted to remain alive for. AL - Before REMAINING AILEEN was REMAINING AILEEN the novel, she was an idea I had for a screenplay. A few years back, around 2014 I had this super vivid vision of a young mom, who was on a plane that was falling from the sky. All hope is lost. Her thoughts revolve around never seeing her children, or husband again, and the devastating reality that she is going to die. Until she wakes up, alive, completely unharmed- or so it appears. At the suggestion of my amazing husband, Aileen became a novel instead of a screenplay, and now she is about to be released into the world and I truly still, cannot believe it. Fun fact, my very first title idea was Vampire Mom, and it was going to be this light-hearted story of a mom who becomes a vampire, until I realized just how HARD it would be to actually try and be a mom and a vampire. While I do keep some light-heartedness in the story, it did end up taking a bit of a darker/ more emotional turn (which I am so excited about) than I originally was planning. But if there is one thing I have learned about writing stories, is that they seem to tell you what they want to be regardless of your original intentions. It's best to just see where it takes you sometimes! AL - My first idea for a title for this book was Vampire Mom, but as the story unfolded it just didn’t fit anymore. My main character Aileen really struggles with her new “life” as a vampire and does all she can to try and make her new life fit back with in her old one. So REMAINING AILEEN felt a little more descriptive of her goal and struggle within the story. I was very grateful my publisher approved of the title! AL - Aileen has a very (in my opinion) special relationship with her mother-in-law Ana, one of my favorite, lighthearted scenes is between these two gals near the end of Chapter 14. AL - I feel like I am pretty partial to Aileen. She is the first character that came to my mind and therefore I think she will always be really special to me. We’ve grown a lot over the last few years, Aileen and I.
AL - I think no matter how hard we writers try, our characters will always hold some sort of familiarity to either ourselves, or people we’ve encountered in our lives. While I didn’t specifically base any of my characters on actual people, there are definitely bits and pieces of people I know within them. AL - I first conceived the idea of Aileen back in 2014, she was ready to query in September of 2017, and then she queried until I signed with Magnolia Press in October of 2018! So it has taken quite a few years to get her from conception to publishing and wow what a journey that has been. AL - I did quite a bit of research, first into how many “vampire mom” books there are (not too many really) and then a did a lot of research into vampire lore and the history of the superstitions. I also read as many vampire novels and watched as many vampire shows/movies as I could find time for. AL - So much. This was my very first attempt at writing a novel, so there have been MANY darlings killed, many words laid to rest in the “coffin” file, needless to say, much as has been learned during this process. AL - I am more of a “plantser” I do outline, but it’s a very bare outline, I work out the details while writing my first draft. AL - My most favorite part is of the process is that initial idea. The spark. That single immeasurable moment where what did not exist now exists and it’s such a great feeling. My next favorite moment is writing the words “The End”. I’ve never felt more accomplished then writing those two words at the end of my first finished draft. AL - What challenges me the most is getting myself to actually sit down and focus. Once I’m settled into a story I can write for hours, but often getting to that point takes a little creativeness on my part. Bribing myself with Netflix binges usually works to get done what I need to get done. AL - Most of my writing time happens at night when the world is sleeping. I find I’m able to focus so much better when there are less distractions. If I have deadlines to reach I do everything I can to make myself sit down and focus during the daylight hours when my kids are in school. But mostly I try to use the late hours to get most of my writing and editing done. AL - I don’t currently have any unfinished books actually, aside from my current WIP. But I do have lots of notes jotted down for future story ideas! AL - I can’t write to music. I’ve tried and I get way to distracted. I also really enjoy titling my chapters. AL - A little about me, I am a thirty-somethings write-at-home-mom of three. Before kids I worked full-time in a salon as a hairstylist. I live in Northern California with my family, our German Shepherd and a small flock of backyard chickens. I also have a slight obsession with collecting houseplants. AL - My husband was a film major and through him I learned a ton about screenwriting and story, and so after writing a few screenplays with him I ventured into the land of novel writing! AL - I love hiking in the mountain forests near my home, going to the lake in the summer with my kids, doing yoga, and knitting, I really love knitting. AL - Yes, I dabble in poetry and screenwriting. I tried blogging but it is not my strong point. AL - Most people don’t know that I play piano (not as well anymore as I used to) but I grew up classically trained thanks to my grandmother being a piano teacher. My favorite composers to play are Beethoven, Bach, and Mozart (the darker and drearier the song the happier my heart). AL - As a child I remember being mesmerized by The Secret Garden. As an adult (and this may seem odd) Twilight was actually quite influential for me. It was the first book series I read after having children and I can’t say exactly what it is about it, but it sparked something within me and I knew writing stories was something I needed to do. AL - I am currently working on a few pieces. One being a YA sci-fi story and another is a witchy fantasy of sorts. AL - Keep going, keep writing, no matter what. Q – What book are you currently reading? AL - I am currently reading the second book in the All Souls Trilogy by Deborah Harkness. I have a huge TBR pile full of last year’s new releases, I’m way behind here but doing what I can to catch up! Autumn lives with her husband and three kids in a deep, dark, magical forest. Fluent in typo and fueled by caffeine, she writes Women’s Fiction with characters that bite. You can find her on Facebook, Twitter, Instagram, or lost somewhere in her jungle of a house due to her massive collection of houseplants. She is also the founder Writer Moms Inc. so, if you happen to be a Writer Mom in search of community and support, check it out! She’d love to have you join!